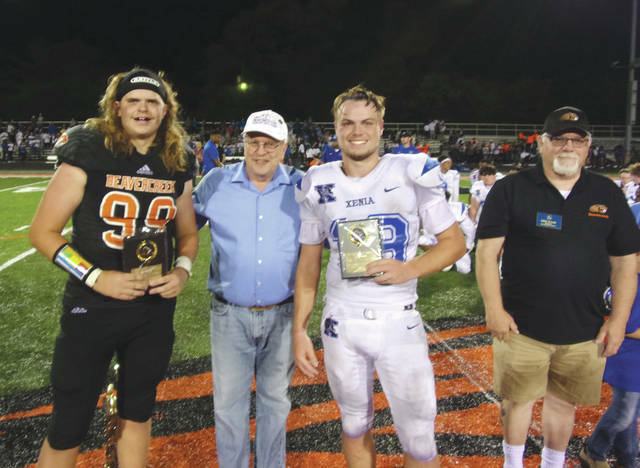 The Backyard Battle’s Defensive Players of the Game — Beavercreek’s Seth Owens (left) and Xenia’s Nick Willis — stand with their awards alongside Beavercreek Mayor Bob Stone (center left) and Beavercreek Kiwanis President Gene Taylor, Aug. 24 at Frank Zink Field in Beavercreek. 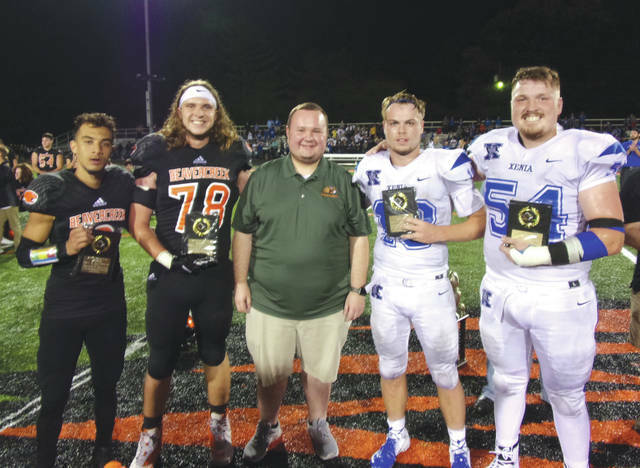 After Friday’s Aug. 24 Backyard Battle high school football game, won by Xenia 41-14 over host Beavercreek, the game’s Walter G Sellers Memorial Leadership Award winners were: Beavercreek’s Maurice Wilson and Connor Tinch, joined by Beavercreek City Councilman Ryan Rushing; and Xenia recipients Nick Willis and Sam Lockwood. 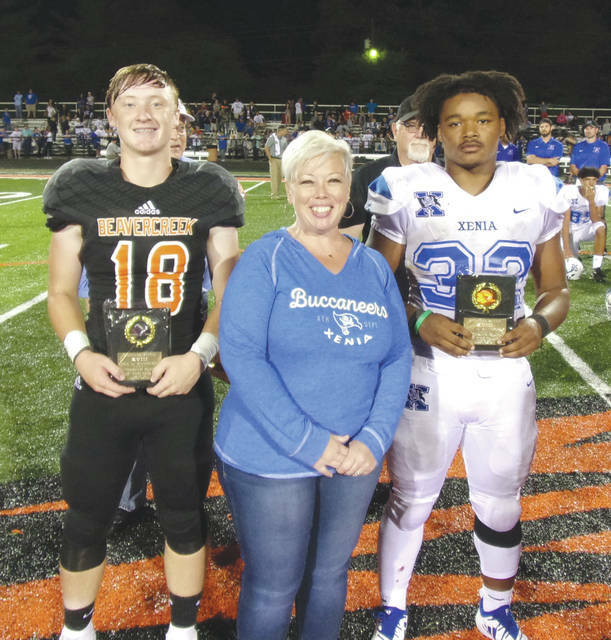 Beavercreek’s Nick Brown (left) and Xenia’s Sincere Wells received their Offensive Players of the Game awards from Xenia Mayor Sarah Mays, Aug. 24 at Miami Valley Hospital Stadium in Beavercreek. 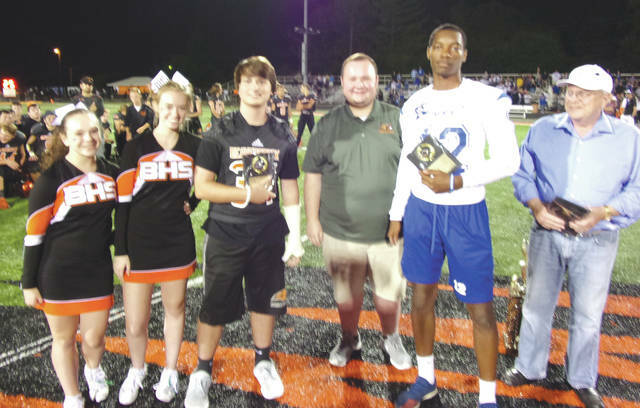 With Beavercreek cheerleaders Mackenzie Drake and Morgan Callahan (left), Beavercreek City Councilman Ryan Rushing (center) and Beavercreek Mayor Bob Stone (right) on hand Aug. 24, the Backyard Battle’s Scout Players of the Week were Colton Hunker for Beavercreek and Xenia’s Hasain Akinyele. 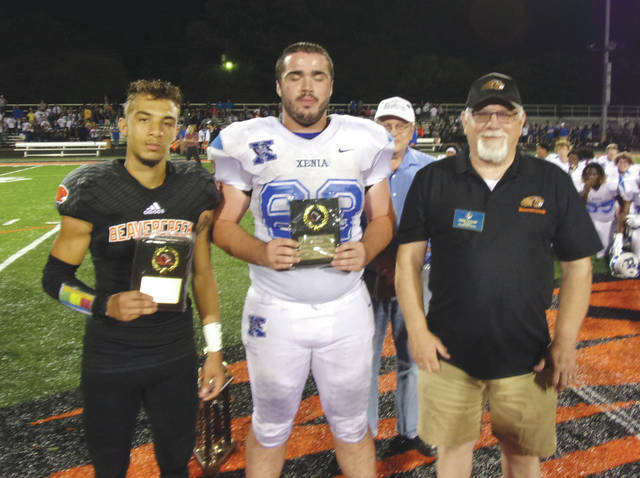 Beavercreek’s Maurice Wilson (left) and Xenia’s Peyton Bartley were named the Backyard Battle’s Special Teams Players of the Game, and their awards were presented by Beavercreek Kiwanis Club President Gene Taylor, Aug. 24 at Beavercreek High. https://www.fairborndailyherald.com/wp-content/uploads/sites/50/2018/08/web1_DefensivePlayersoftheGame_PS-1-.jpgThe Backyard Battle’s Defensive Players of the Game — Beavercreek’s Seth Owens (left) and Xenia’s Nick Willis — stand with their awards alongside Beavercreek Mayor Bob Stone (center left) and Beavercreek Kiwanis President Gene Taylor, Aug. 24 at Frank Zink Field in Beavercreek. Submitted photos. https://www.fairborndailyherald.com/wp-content/uploads/sites/50/2018/08/web1_Leadership_PS.jpgAfter Friday’s Aug. 24 Backyard Battle high school football game, won by Xenia 41-14 over host Beavercreek, the game’s Walter G Sellers Memorial Leadership Award winners were: Beavercreek’s Maurice Wilson and Connor Tinch, joined by Beavercreek City Councilman Ryan Rushing; and Xenia recipients Nick Willis and Sam Lockwood. Submitted photos. https://www.fairborndailyherald.com/wp-content/uploads/sites/50/2018/08/web1_OffensivePlayersoftheGame_PS.jpgBeavercreek’s Nick Brown (left) and Xenia’s Sincere Wells received their Offensive Players of the Game awards from Xenia Mayor Sarah Mays, Aug. 24 at Miami Valley Hospital Stadium in Beavercreek. Submitted photos. https://www.fairborndailyherald.com/wp-content/uploads/sites/50/2018/08/web1_ScoutPlayeroftheWeek_PS.jpgWith Beavercreek cheerleaders Mackenzie Drake and Morgan Callahan (left), Beavercreek City Councilman Ryan Rushing (center) and Beavercreek Mayor Bob Stone (right) on hand Aug. 24, the Backyard Battle’s Scout Players of the Week were Colton Hunker for Beavercreek and Xenia’s Hasain Akinyele. Submitted photos. https://www.fairborndailyherald.com/wp-content/uploads/sites/50/2018/08/web1_SpecialTeamsPOG_PS.jpgBeavercreek’s Maurice Wilson (left) and Xenia’s Peyton Bartley were named the Backyard Battle’s Special Teams Players of the Game, and their awards were presented by Beavercreek Kiwanis Club President Gene Taylor, Aug. 24 at Beavercreek High. Submitted photos.